The Bangladesh opposition party candidate for key mayoral elections in the southern city of Chittagong has won an overwhelming victory. The incumbent Awami League candidate Mohiuddin Chowdhury defeated the ruling party candidate by a huge margin. Correspondents say that the result is a setback for the government, and will strengthen the opposition's demand for early general elections. Unofficial results showed that Mr Chowdhury won by nearly 100,000 votes. The BBC's Waliur Rahman in Dhaka says that Mr Chowdhury substantially increased his majority. Our correspondent says that the scale of the win reflects increasing public disillusionment with the Bangladesh Nationalist Party (BNP) government of Prime Minister Khaleda Zia, as well as Mr Chowdhury's successful targeting of local issues. 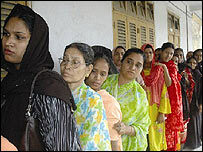 The mayoral election could be the last major vote to take place in Bangladesh before general elections scheduled for October 2006. The Awami League insists that the government has lost popularity and should now hold the vote earlier. "This victory will lead us to more victories and force the government to concede our demands," Awami League General-Secretary Abdul Jalil told reporters in Dhaka. But the prime minister rejected that demand and vowed to continue until the end of her government's tenure. 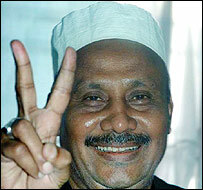 The win is Mr Chowdhury's third as mayoral candidate in Chittagong, the second biggest city in the country. He told cheering supporters in Chittagong that it was a "massive victory" of the people's desire and a strong protest against the government. The BNP was expecting to win the post, as it holds the city's three parliamentary seats. Election Commission officials and poll observers say the vote was largely free and fair, despite complaints of false votes and attempts at rigging by both main contenders. The voting ended at 1600 local time on Monday, but the results were declared more than twelve hours after the ballots were closed. The opposition leader and former Prime Minister, Sheikh Hasina, earlier told the BBC that the delay in declaring results was an attempt to "seize the people's verdict". But Election Commission officials denied the allegations, saying it was a procedural delay in counting of nearly 500,000 votes. However the government has accepted the defeat. Officials said the Prime Minister, Khaleda Zia, congratulated Mr Chowdhury on his re-election and thanked the people in Chittagong "for extending all-out cooperation in holding the election in a free and peaceful atmosphere".